It all begins with a fugitive billionaire and the promise of a cash reward. 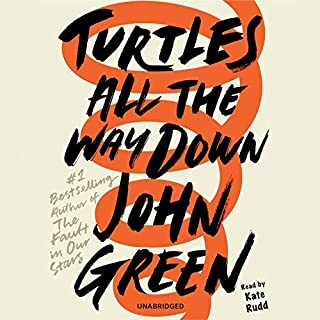 Turtles All the Way Down is about lifelong friendship, the intimacy of an unexpected reunion, Star Wars fan fiction, and tuatara. But at its heart is Aza Holmes, a young woman navigating daily existence within the ever-tightening spiral of her own thoughts. Surprisingly small amount of actual turtles. I have read all of John Greens books and this was my least favorite. That's not to say it is a bad book, it's a very well structured and thought provoking book, and I believe it will be especially touching to those readers who suffer from mental illness. That said, I was very distracted by Kate Rudd's performance. Her male voices sounded like she was mocking teenage boys and her voice for the best friend was inconsistent and gnawing. I believe the audio would have been better had she not changed voices for each character, her regular voice was very compelling. Additionally, given John Green's foreshadowing I felt the main 'mystery clue' Aza was trying to solve was obvious, and thus it was very frustrating when she continually brought it up throughout the book. Despite John Green writing realistic teen fiction, all of his novels feel like a distortion of reality, many of the events end up feeling unbelievable. All of that aside, the main characters were chArming, and had depth, and the reader spends the whole book trying to decide if they like the best friend or not, which is really intriguing. All of the characters break the readers expectations. This book is a good read for those suffering from mental illness and young adults struggling to understand mental illness.